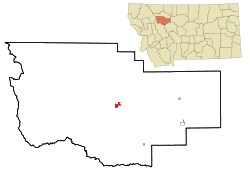 Choteau is a city in and the county seat of Teton County, Montana, United States. It lies along U.S. Routes 89 and 287 (the latter terminating at the former in this city) about 20 miles (32 km) east of the Rocky Mountains, near Flathead National Forest, the Rocky Mountain Division of Lewis and Clark National Forest, and Glacier National Park. The population was 1,684 at the 2010 census. 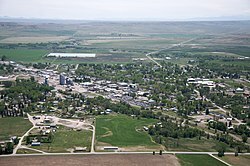 The Montana town is named for French fur-trapper and explorer Pierre Chouteau, Jr., who is also the namesake of Chouteau County, Montana (county seat: Fort Benton). According to the United States Census Bureau, the city has a total area of 1.83 square miles (4.74 km2), all of it land. The Teton River runs nearby, although for some distance upstream of Choteau, it is dry during much of the year. As of the census of 2010, there were 1,684 people, 791 households, and 441 families residing in the city. The population density was 920.2 inhabitants per square mile (355.3/km2). There were 888 housing units at an average density of 485.2 per square mile (187.3/km2). The racial makeup of the city was 95.0% White, 2.1% Native American, 0.2% Asian, 0.1% Pacific Islander, 0.3% from other races, and 2.3% from two or more races. Hispanic or Latino of any race were 1.7% of the population. There were 791 households of which 21.9% had children under the age of 18 living with them, 45.8% were married couples living together, 6.8% had a female householder with no husband present, 3.2% had a male householder with no wife present, and 44.2% were non-families. 39.6% of all households were made up of individuals and 20% had someone living alone who was 65 years of age or older. The average household size was 2.04 and the average family size was 2.75. The median age in the city was 49.1 years. 19.5% of residents were under the age of 18; 5.1% were between the ages of 18 and 24; 19.8% were from 25 to 44; 29.8% were from 45 to 64; and 25.8% were 65 years of age or older. The gender makeup of the city was 46.4% male and 53.6% female. As of the census of 2000, there were 1,781 people, 807 households, and 464 families residing in the city. The population density was 994.3 people per square mile (383.9/km2). There were 897 housing units at an average density of 500.8 per square mile (193.4/km2). The racial makeup of the city was 93.94% White, 0.06% African American, 2.92% Native American, 0.11% Asian, 0.22% from other races, and 2.75% from two or more races. Hispanic or Latino of any race were 1.18% of the population. There were 807 households out of which 24.9% had children under the age of 18 living with them, 46.8% were married couples living together, 8.6% had a female householder with no husband present, and 42.4% were non-families. 39.2% of all households were made up of individuals and 21.9% had someone living alone who was 65 years of age or older. The average household size was 2.13 and the average family size was 2.82. In the city, the population was spread out with 22.7% under the age of 18, 4.4% from 18 to 24, 21.4% from 25 to 44, 25.8% from 45 to 64, and 25.7% who were 65 years of age or older. The median age was 46 years. For every 100 females there ware 86.3 males. For every 100 females age 18 and over, there were 80.9 males. The median income for a household in the city was $25,708, and the median income for a family was $35,655. Males had a median income of $22,429 versus $17,098 for females. The per capita income for the city was $14,999. About 12.7% of families and 17.6% of the population were below the poverty line, including 30.2% of those under the age of 18 and 12.5% of those 65 and older. Choteau's mayor is Dan Lannen. Choteau has made national news in the U.S. because it is the town nearest to a 2,700-acre (11 km2) ranch that David Letterman purchased in 1999 as a vacation home. Letterman has talked about the ranch on his late-night show and showed photos of a black bear invading the place in September 2003. On his first show after the attacks of September 11, 2001, Letterman gave an impassioned monologue about New York City in the aftermath. He concluded the now-famous 7-minute speech by mentioning Choteau's rally to raise money for victims of the attacks, despite the long drought there. On March 19, 2009, Letterman married his girlfriend of 23 years at the Teton County Courthouse in Choteau. In 2008, school authorities in Choteau made national news headlines by canceling a speaking engagement by Nobel laureate climate researcher Steve Running, who was scheduled to speak to local high school students. Choteau experiences a semi-arid climate (Köppen BSk) with cold, dry winters and hot, wetter summers. John Edward Erickson, Governor of Montana, was born in Stoughton. Choteau Public Schools serves all grades of children in the community. Choteau High School received a 2009 Best High School Bronze Award recognition from U.S. News & World Report for its excellence in education. The elementary school has 214 students in grades K-8 while the high school has 113 students in grades 9-12. ^ "Origins of Names on Milwaukee". Roundup Record-Tribune & Winnett Times. August 22, 1940. p. 6. Retrieved April 27, 2015. ^ "Population Estimates". United States Census Bureau. Archived from the original on October 19, 2016. Retrieved July 20, 2016. ^ "City of Choteau | Contact Us". Retrieved 2018-06-19. ^ Ted (September 11, 2003). "Live from New York". Crooked Timber. ^ "David Letterman marries longtime girlfriend Regina Lasko". Chicago Tribune. March 24, 2009. ^ Robbins, Jim (January 17, 2008). "Climate Talk's Cancellation Splits a Town". The New York Times. ^ "Monthly Averages for Choteau, MT". The Weather Channel. Retrieved January 15, 2011. ^ "Montana Governor John Edward Erickson". National Governors Association. Retrieved October 10, 2012. ^ "About.com:Dinosaurs". Retrieved 17 January 2010. ^ "The Montana Dinosaur Trail". Retrieved 17 January 2010. ^ "The Old Trail Museum - Maiasaura Exhibit". Archived from the original on 22 July 2009. Retrieved 17 January 2010.